A NEW approach to solving behavioral challenges. Mona Delahooke, Ph.D., is a clinical and consulting psychologist specializing in supporting children and families. She has worked widely with multi-disciplinary teams in the areas of developmental, behavioral, learning, and emotional differences for over 30 years. Her first book, Social and Emotional Development in Early Intervention: A Skills Guide for Working with Children describes a contemporary, neurodevelopmental approach useful for all childhood professionals. 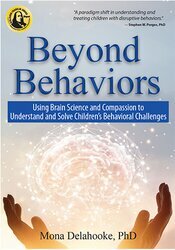 Beyond Behaviors provides the basis for a paradigm shift in understanding and treating children with disruptive behaviors. Historically, educational and therapeutic models treat anti-social and asocial behavior as motivated and incentivized. In this accessible and beautifully written volume, Dr. Delahooke pulls the veil off this myth and replaces it with a neurobiologically-informed treatment model that provides insightful directives leading to effective outcomes. As a developmental psychologist, compassion teacher, and autism mom, I can whole-heartedly say this book is brilliant. Traditional methods of shaping children s behaviors typically ignore children's emotional state, at great cost to the child s ability to learn, develop, and form secure relationships. This book provides concrete ways to help understand safety as the foundation for children s learning, working with rather than against natural brain functions to maximize learning potential. I love this book. It will be one I give and recommend over and over. Beyond Behaviors is succinct, accessible, practical, science-based. And it s a game changer. My hope is that not only parents, educators, clinicians, and all helping professionals read it, but that it becomes required reading for professionals in training. It s time for us to use science-informed approaches to go beyond mere behaviors to support children and their caregivers, and this is the book to light the way. This book will embrace every parent and professional puzzling over behavioral challenges and make you question the assumptions about their meaning and re-evaluate how to help. Dr. Delahooke reframes our understanding by integrating perspectives from development, brain science, mental health, and child and parent experiences using example after example to guide you towards insight and compassionate approaches that are respectful of neurodiversity. Beyond Behaviors will help every child and family progress, feel safe, enjoy relationships, and develop to their fullest. Dr. Mona Delahooke is a child psychologist with over 30 years of experience working with children who have behavioral challenges, including those who are neurodiverse and/or have experienced early trauma. In this easily readable book, Dr. Delahooke encourages child professionals and families to see concerning behaviors as the tip of an iceberg that obscures early embedded feelings of danger or life threat. With compassion and insight, she guides us toward creating healing environments of safety and security." I love Beyond Behaviors for a whole lot of reasons. First, I think, is the message of compassionate non-judgment. Mona Delahooke shows how important it is that parents be compassionate with themselves, and practice good self-care techniques as necessary prerequisites for intelligent responding to their challenging children. One of the best features of this book are the practical, empowering, step-by-step ideas for finding the calm self-acceptance necessary for building a healing, supportive relationship with even the most challenging and frightened child. Mona Delahooke provides a reality check for those who seek to ameliorate children s behavior. She offers a fresh, comprehensive perspective, and a more humane way of understanding, teaching, treating, and supporting children who are struggling. Dr. Delahooke focuses on an integrated mind/body approach, helping parents and children deal thoughtfully and respectfully with behavioral differences and the iceberg of causality. Beyond Behaviors includes case histories, worksheets, practical strategies, resources, and an abundance of information empowering readers to understand what underlies behavioral challenges, and forge meaningful, healing, lasting solutions. A welcome addition to the literature on parenting! Brilliant! Dr. Mona Delahooke integrates knowledge from the fields of infant mental health, child development, clinical psychology and neuroscience to provide a revolutionary approach to challenging behaviors in children. Complex neurobiologic processes are beautifully translated into a practical model for meaningful intervention. The unique, yet critical, perspective on children's most challenging behaviors has the power to transform lives. This book is an essential read for all people who care for or interact with children. This is a wonderful book that takes complicated concepts and new ways of thinking about children and makes them digestible and useable for parents and professionals alike. This book should be required reading for frustrated parents and those of us in a position of diagnosing or creating behavior plans for children. Imagine the amazing outcomes if we followed Mona Delahooke's guide to empower and support children through their big feelings and behaviors, rather than focusing only on the tip of the iceberg. In Beyond Behaviors, Mona Delahooke, PhD, applies the Polyvagal theory developed by Stephen Porges to children, convincingly making the case that many children who can't seem to behave themselves simply don't have that developmental capacity yet, and giving us a social-emotional roadmap for how children learn to self-regulate. Delahooke guides us to the realization that children act out when they feel stressed, so the most important tool in our toolbox is always our connection with the child, which restores safety. This break-through book reframes children who exhibit "problem" behavior and challenges us as therapists, teachers and parents to shift our own paradigm so that we can help them. Highly recommended.